Own your content, customize your slide deck and integrate your favorite marketing tools. Keep your content branded, and keep the traffic, too. Easily add tracking pixels from your marketing platform and analytics services. There’s no restriction at all on the reporting you can do. Set the sharing URL and download URL explicitly to further track engagement and ensure everyone’s coming to your site to learn more. For instance: your sharing URL can actually be a great piece of content on your site that gives more context and resources for your presentation, or a landing page to learn more from you. That’s key when social media becomes the way your message gets spread. Support for Twitter player cards is built in, so social sharing is a breeze. When your link gets shared, viewers using Twitter.com or Twitter’s native app will be able to view your entire presentation—all while the link being shared is on your website. 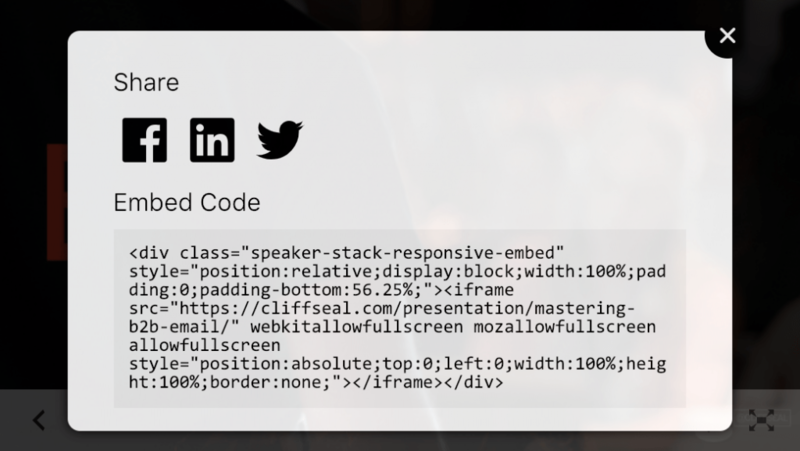 Click 'Share' under the slideshow to see a responsive embed code for anyone to put your presentation on their site and allow them to share it easily. If you've set up analytics, you'll see that traffic, too. Speaker Stack works on a self-hosted WordPress website (the most popular content management system in the world). That means you get all the traffic on your site for your presentations. It also means you’re not subject to anyone else’s terms when you upload your content. You always own it. Don’t have a WordPress site of your own? Speaker Stack is available as a monthly service that can host unlimited presentations—keep it just for your slides or upgrade it to a full-fledged site to get new speaking engagements. Speaker Stack is currently running a closed beta. Leave your info below and we'll be in touch. I want to be involved in the beta! Just let me know when Speaker Stack is ready for launch.